I'm hosting a FB party on January 26th to celebrate my release. There will be guest authors, contests, giveaways, eye candy, and more! Please join me and the others. I started writing in late 1996 and wanted to write a classic romance, "Boy Meets Girl, Boy Loses Girl, Boy Gets Girl Back" sort of thing. I wanted it to be a contemporary, even though I really loved Regency--I just didn't think I could write a historical yet, because I was a total newbie. Unfortunately, I didn't know much about romance other than that formula, so when I sat down and thought about what kind of hero I though would be appealing, I came up with...a football quarterback. Not only a quarterback, but an injured one. That's common fare now, but back in the 90s, no one but Susan Elizabeth Phillips could make a sports hero work. I found the book unsaleable for nearly a decade, before Five Star published it in a lovely first edition. 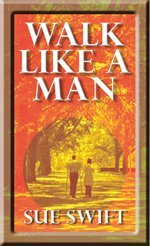 The hardcover edition of Walk Like A Man is still available on Amazon--print never quite goes away. It may still be sitting on the shelves of your local library. 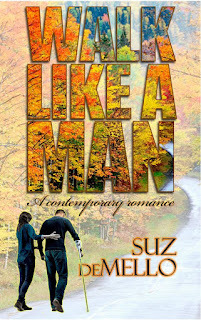 "... such a delight to read...tantalizing sexual tension, witty banter... not only a beautiful love story, great characterization and a good plot, but ...emotions that will reach in and squeeze the breath out of the reader... a fiery read. A must buy, a must read, this story is not to be missed!!" But time marches on, and, delightfully, reversions happen. That the rights to the book returned to me gave me the opportunity to update and re-edit the book...and here it is. Hope you love it!